Most boat owners would agree that having a vessel of any kind – sailing dinghy, rowing boat, canoe, sailing yacht, cabin cruiser, you name it – means that over time you acquire ‘stuff’. It might start out with a couple of hanks of rope, or a spare pair of oars but eventually ‘stuff’ starts to take over your life – not to mention your garage, garden shed, attic and all. I’ve owned several boats during my lifetime starting with a couple of sailing dinghies and working my way through an 18-foot Solar Corsair outboard powered day boat through a 36-foot, 12-ton ex-RNLI lifeboat with a 1950s vintage Petter cub diesel engine, a 25-foot sailing sloop, a Norman cabin cruiser up to the present to the Seamaster Admiral cruiser that I own jointly with my wife, Julie and my brother, Alan. And although most of those craft are long consigned to history, I still have artefacts from each and every one of them. Like, for example, a rudder and tiller from an Enterprise sailing dinghy, a pair of oars from a rowing dinghy, an outboard cover from the Norman, the safety harnesses from the sailing sloop, steering wheels, remote control cables for the outboard, and ropes – dozens and dozens of ropes from the entire range. That’s compounded by things I’ve bought that might just come in useful at some point (like the engine compartment sound deadening felt that we bought from the Southampton Boat Show for Terra Nova only to get home and find that there was no way of fitting it or the wonderfully cheap oil filter cartridges that turned out to be just the wrong size). So from that, you can begin to understand why Julie starts to worry whenever Beaulieu Boat Jumble comes around – which it does on Sunday, April 28. Beaulieu is the biggest boat jumble in Europe, attracting tens of thousands of people to several acres of land behind Lord Montagu’s stately home in the New Forest and it is a mecca for boat owners. You might by looking for a gasket set for a 1972 Volvo Penta engine or a classic wooden ship’s wheel to decorate the living room. 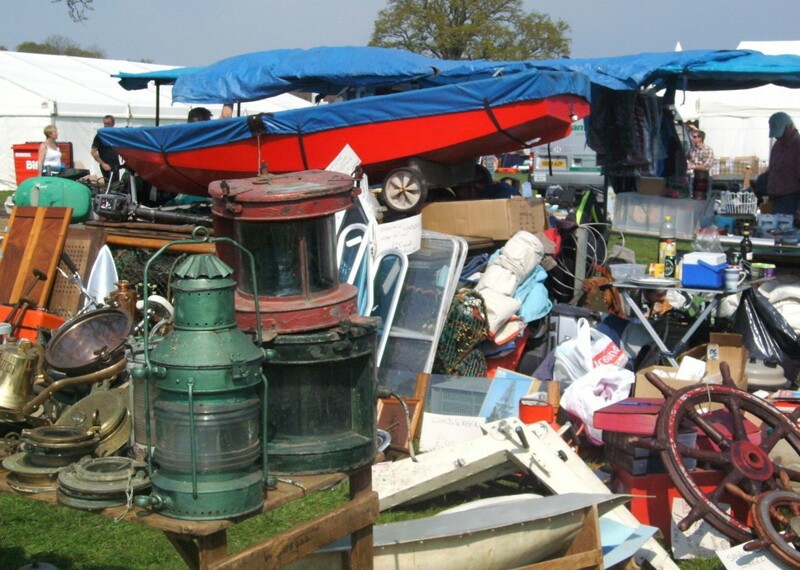 It doesn’t really matter what you’re after, the chances are that you’ll find it at Beaulieu so it is wonderful to see the boat jumble back after a disaster in 2012. Incessant rain last year had turned the fields used to stage the show into nothing short of a swamp and the thought of dozens of heavy lorries and vans driving across it to set up stalls following by thousands of people tramping across it was too dangerous even to consider. Beaulieu PR officer Margaret Rowles said: “It was the first time in the show’s history that we had to cancel it – and it was clearly a real disappointment both for us and for those who love to come and browse. Over the years, the jumble has grown exponentially so that now not only are there 1,000 stands of boating bits but a separate section called Boatmall with many of the top nautical chandlers selling their wares and Boatmart – where you can actually purchase a used boat ranging from dinghies to trailer sailers and cabin cruisers. Boatmart and Boatmall open at 9am and the jumble itself opens at 10am. Tickets can be bought in advance costing £8.50 for adults and £6.40 for children or on the day for £9.70 and £7.50 respectively. There is a huge free car park and if you end up buying something too heavy to carry back to the car, there will be the usual shuttle service of vans available. If you have a boat to sell, you can take it along for just £30 – the same price if you want to sell your boating bits from the boot of your car.